Hey, hi! Welcome to the very last Friday of January 2016!! Like, whoa! How is January already over?? Complete craziness, but I have to say it was a great month. Super busy, and super cold, but filled with yummy (HEALTHY) eats! I know this may seem odd, but I feel a little more refreshed and inspired to keep chugging along now than I did a month ago. After Christmas, I think I was just BEAT, but something about this last month and all the colorful veggies…and dark chocolate, has me feeling kind of excited and energized. What about you guys? Are you ready to enter February? Ready for the Super Bowl? Excited for Valentine’s Day? Ready to be one month closer to spring?!? Speaking of spring, have you guys started thinking about spring break yet? I am seriously thinking that after I get my wisdom teeth pulled at the end of March I may just need to get myself to Florida to bask in the sun for a little bit. My brother Kai really wants to go for his Spring Break, and I wouldn’t mind spending some time with my grandma, so I might try to see if that’s a possibility. But with 5 children and 16 grandchildren – 7 of them from our fam – my grandparents always have a lot a visitors around Easter, so they might just be BOOKED. I LOVE Florida! What about you guys? Any fun plans yet?? Another major highlight for me this month was creating all these healthy recipes. 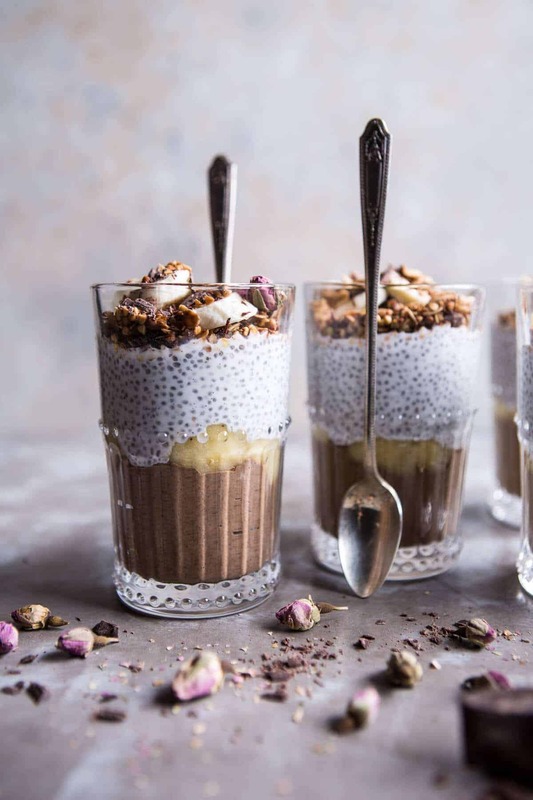 I know I’ve already touched on this topic this week, but seriously, these have been some of my favorite recipes, and these banana and chocolate chia cream pie parfaits might just be one of my favorites. They are literally what banana cream pie dreams are made of. Light, soft, fluffy, chocolatey perfection. And then bonus – they’re healthy too! Actually, they’re more than healthy, they’re like superfood status healthy. 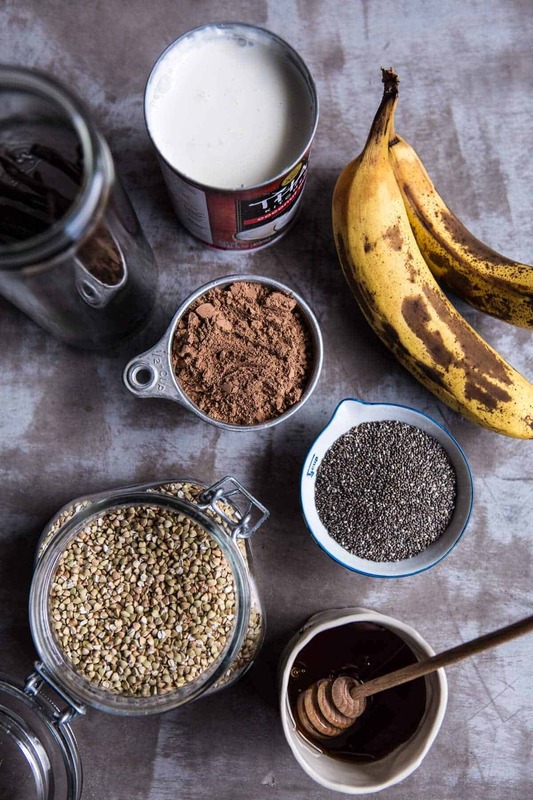 Chia seeds, bananas, buckwheat, cacao, dark chocolate, oats and nut/coconut milk. AND they are so simple! It does take a little chill time for those chia seeds to do their magic, but other than that, they’re quick, easy and simple. Oh and of course delicious! If you’re unfamiliar with chia seeds, you should familiarize yourself with them now. 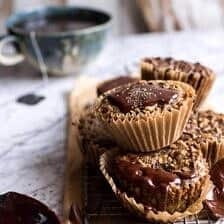 They are an amazing, teensy tinsy little seed that really packs in the nutrients and creates one KILLER make-shift vegan pudding. 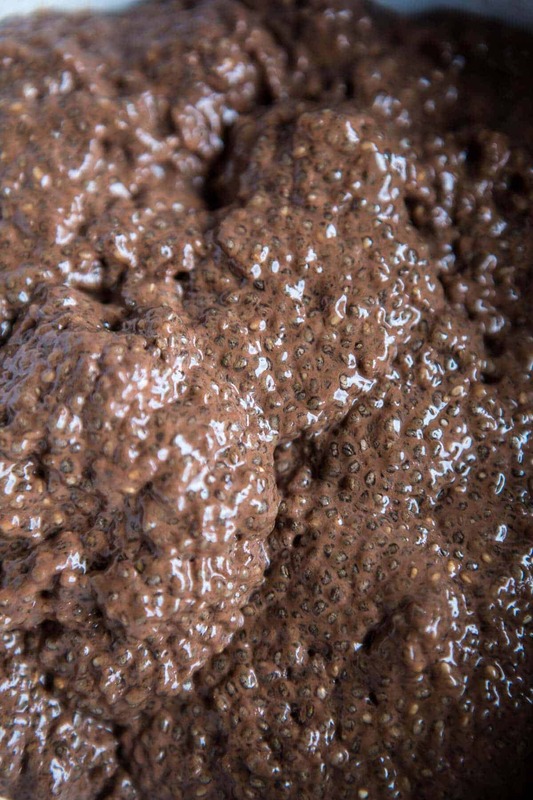 When you add chia seeds to a liquid, they begin to soften, plump up and become gel like (but in a good way). Honestly, it’s like magic, AND chia seeds are packed full of protein and healthy O-mega 3’s. You see, pretty cool, right? 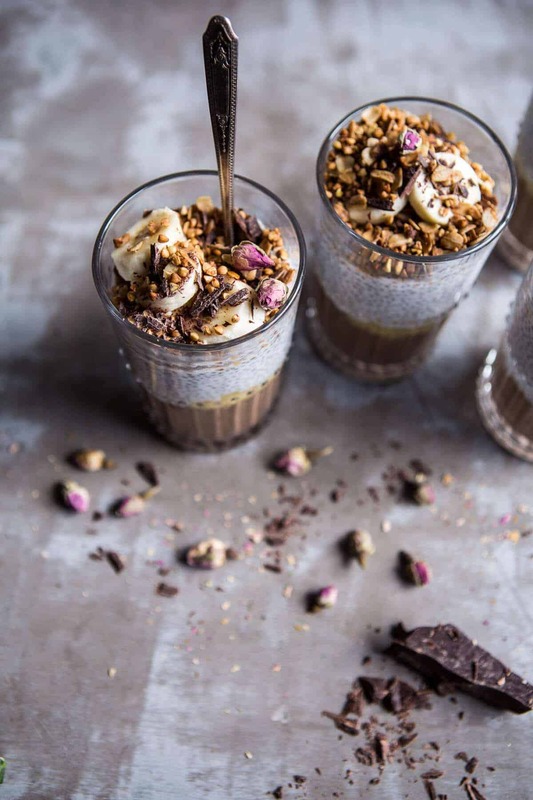 SO… to create this fun pudding parfait, I used chia seeds to thicken up the base. It works SO well. For the chocolate pudding, I blended the chia seeds into the pudding for a more creamy texture, but for the banana pudding I left them whole for a little texture variation… and because I love the look of the chia seeds in the white cream. I know, I am so weird. 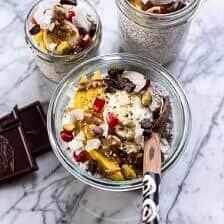 Chia pudding is really simple to make, you just mix all the ingredients (in today’s case almond milk, coconut milk, chia seeds, maple or honey and a little vanilla) in a bowl and let them chill in the fridge until they are thick and creamy. For best results I like to let the pudding sit overnight, but honestly, sometimes I only wait an hour and the pudding is already thick enough to eat…what? Hey, waiting is HARD. To finish these parfaits, I caramelized some raw buckwheat groats and oats with a little maple, and a little salt. DELISH. They are the perfect toppings along with some fresh banana slices, chopped chocolate and dried roses. 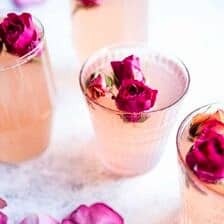 You don’t have to include the dried roses, but I personally love them, not only for looks, but they taste great crushed over top of the bananas. Yes, please! Here’s to healthy pudding and a Friday night snuggled up in blankets!! <–aka my perfect Friday night! Combine all the ingredients in a bowl, stirring well to combine. Cover and let sit, preferably overnight, in the fridge or for at least 4 hours. Combine the coconut milk, chia seeds honey, vanilla and a pinch of salt in a bowl. Cover and place in the fridge for 1 hour, stirring twice until thickened OR let sit in the fridge overnight until thickened and creamy. Add the buckwheat, oats, maple and coconut oil. Sprinkle with salt. Toss well to combine, making sure everything is evenly coated. Bake for 10-15 minutes or until the buckwheat + oats are toasted. Divide the chocolate pudding between 5-4 serving glasses. If desired add a layer of mashed banana to each glass. Top with a layer of the coconut cream pudding. If not serving right away, cover and chill in the fridge for up to 3-4 days (if chilling this long, leave OUT the layer of mashed banana and swirl it in before serving). To serve, top with sliced banana, caramelized buckwheat, dries roses and chocolate. EAT. FYI, that spoon…not even close to big enough. I switched to a soup spoon immediately after taking these shots. Love me some pudding! These look amazing! 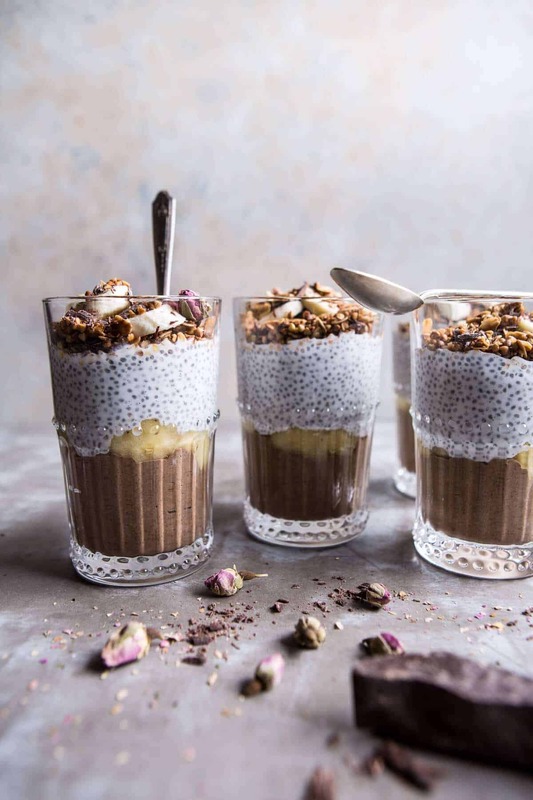 I’ve actually never had chia pudding (whaaaaa) so these would be the perfect thing to try to get started!! These look delicious! I love all the different layers and components, you can’t go wrong with bananas and chocolate! i might have reservations about going to florida right after getting wisdom teeth removed; i didn’t have the best experience (i couldn’t do anything without feeling nauseous for about a week), but my best friend and brother were both up and running within a day (and devouring plenty of fried chicken) so who knows. Really, how did this happen? HOw is January over already? Oh my god I can’t believe January is almost over! It seemed to go by in a whim! This pudding is the PERFECT way to celebrate the last Friday!! Love all the textures AND the chocolate in this pudding, I’m a big dark chocolate fan. You think I could add more mashed banana to make it a little more banana-y tasting?? Just curious! Hi! Yes, you can totally add as much banana as you want. YUM! Thanks! Tieghan I’ve been following your blog forever now and your recipes are epic in our house. Love how much inspiration you add to my day. You will be eating plenty of your delicious pudding minus the added crunchy toppings when you have your wisdom teeth out. Just thought I’d give you a tip for your wisdom teeth recovery that worked great for my kids. Take 2 really long socks and tie the toe ends together. Put ice packs (or frozen veggies) in each sock. Put the socks against your jaws and tie the open ends on top of your head. Not very stylish, but it’s a hands free way to keep your jaws iced which is really key to keep the swelling and bruising to a minimum for the first couple of days. I think a trip to Florida would be a great way to kickstart the spring! A couple of months back I was on a big chia seed kick and bought a truckload of these omega 3 powerhouses. Then I moved and they just sat in my pantry begging to be a regular staple in our meals once again. But life got busy and the chia seeds just sat. I think these parfaits are the perfect way to reacquaint ourselves with these old friends. . .they look absolutely delicious. oh perfect! Thank you and have a great weekend! 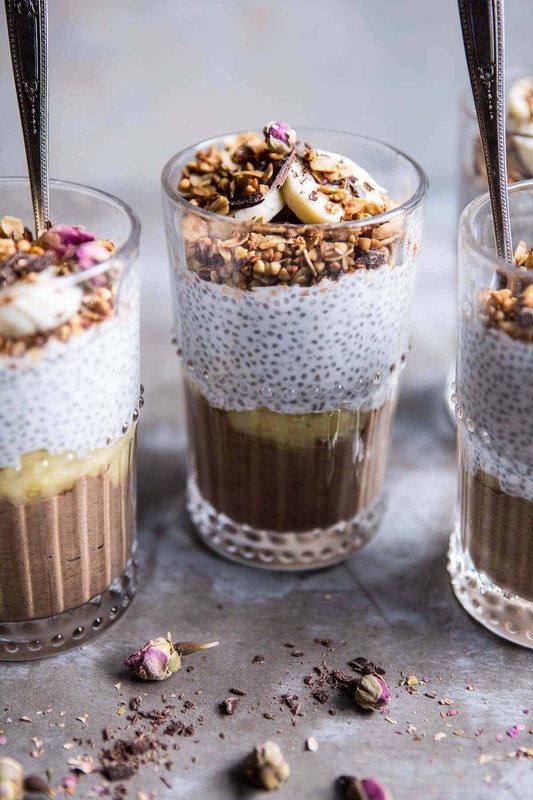 I am all about chia pudding right now, this is going to be a great addition! Thanks Alyssa! Have a great weekend! These look delicious, I can’t wait to make them! Thank you, Amanda! Have a great weekend! Ahhhhh, PLEASE keep posting healthy dessert/breakfast/snack recipes!! I am mostly plant-based so while I do eat meat in my meals, most of my dessert-making/sweets are all SUPER healthy. I’ve been extra drawn to your blog this month and have so enjoyed all of your vibrant and wholesome plant-based recipes. Keep it up!! THANK YOU, Rebecca! Have a great weekend! The highlight of my month was definitely finishing my exams for this semester! Thank you so much, Katie! Have a great weekend! Chia seeds are the best! I use them to thicken my overnight oats. I have everything in my pantry for this except bananas so….yeah. This is happening and I will probably eat it for breakfast and not even care. I was literally just thinking about looking up some recipes for healthy sweets and this is PERFECT. Thank you for all your inspiration + gorgeous photography. What a deliciously sneaky way to eat chia! This looks heavenly! Great blog post girlie. Thank you so much, Jessi! Have a great weekend! Amazing idea on how to use chia seeds. Thanks so much! Looks amazing. I just got some chia seeds and haven’t made anything yet so thanks for the inspiration! I decided to just do the chocolate pudding to simplify it and added a little Greek yogurt when I blended it to give it a little more richness/creaminess. So good!! Thanks Tieghan! Hope you’re not going through withdrawals without Asher 24/7! THANK YOU! So happy you love these! 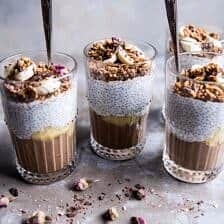 I’ve only just gotten into chia pudding so haven’t tried many varieties yet but this one looks really delicious, I love the idea that you can eat chocolate for breakfast and it still be totally healthy! Thanks Hannah! Hope you had a great weekend! These look so indulgent I cannot believe they are good for me! I love the styling on this! These look amazing! I need a day off where I can spend it trying out all of your incredible recipes! Runs to the kitchen to prepare immediately, will share your recipe on IG and tag you in. Thank you for such a mouthwatering recipe! Wow! This is gorgeous! I love the way all the layers look and it sounds so delicious! Yum!! Oh my! These are so pretty and filled with amazing flavours. LOVE the caramelised buckwheat…it looks incredible! This looks amazing and it must be delicious. Ah, I just want to have one right now. By the way. I’m from Florida – Miami. Definitely worth the vacation. YES! I have got to get myself to Florida! It is currently -10. UGH. I didn’t watch too much of the game, but I heard the Broncos smashed the Panthers! It wasn’t too competitive, either! Anyways, these parfaits look absolutely stunning! They’ll definitely be a crowd winner! Can you eat any dried roses? Where do you get yours, or do you dry your own. They add such a beautiful touch to the pudding. Thank you for the recipe! HI Tammy, yes you can eat roses! I buy mine dried on Amazon and then fresh at whole foods. Thanks! Love the look of all the layers! Looks so good! This recipe looks delicious! So excited to try it! What can you use instead of the vanilla bean for the coconut banana cream? I’m not sure I’ll be able to find one. HI! Use vanilla extract. About 1 teaspoon. Thanks!! I made the chocolate pudding but it’s not thickening. It’s been in the fridge for about 20 hours. Any suggestions on how to save it? I am really sorry for the trouble. Has it thickened at all? Did you use anything or do anything differently? I would add another tablespoon of chia seeds and see if that does the trick. Making this recipe as I type. Just curious, for the coconut banana cream, you have bananas in the ingredients list, but in the directions, you don’t mention putting them in. Do they mix in with the over ingredients for overnight or are they only for swirling in the next morning? Only for swirling in the morning. Sorry about that I will fix the recipe! Hope you love this! Thanks! That’s what I ended up doing, glad I made the right choice 🙂 I absolutely loved the recipe, especially the coconut cream. The only thing I will change next time I make it is the amount of salt in the chocolate cream. Instead of 1/2 teaspoon, I might just throw in a tiny pinch. For me, it was so salty, I couldn’t eat the chocolate part. So glad I found your blog, I will keep following your recipes! OH NO!! So sorry it turned out watery, did you follow the recipe? Yum! Never thought to blend chia pudding for a different consistency. Going to try this! 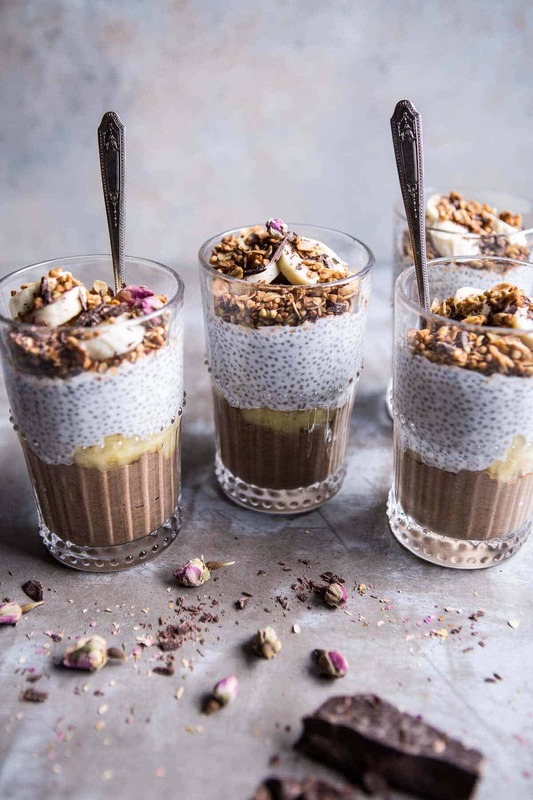 Will definitely try this, what would be the calories for the chia pudding? I am sorry, I do not know the calories for this. Hope you love the recipe! These are amazing and you’re so creative. Thank you! Glad you like them! Thanks Kelly! Hi there! 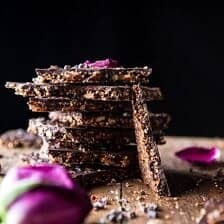 My name is Kate and I just recently came across your blog, and I saw this recipe that included chia seeds! 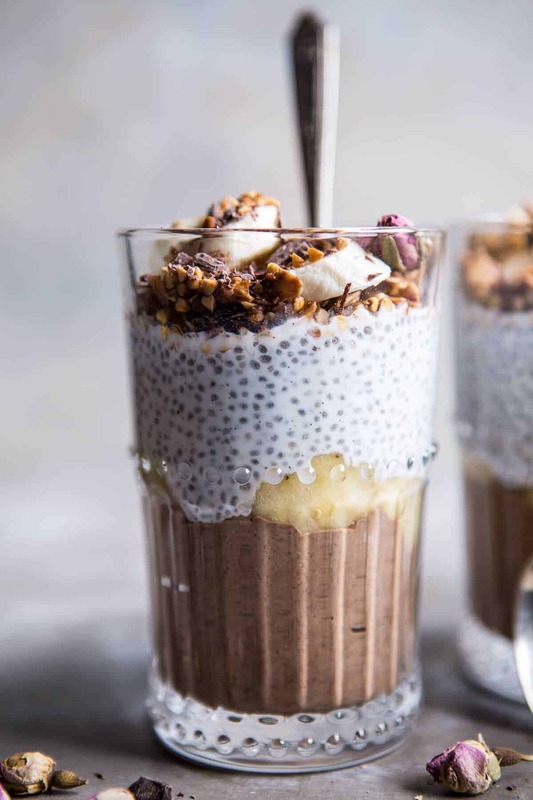 I was introduced to chia seeds through one of my aunts, about a year-and-a-half ago, and they’ve changed my life, especially with both breakfast, “healthy” desserts and smoothies! I stumbled upon your chocolate banana cream pudding recipe, and I noticed that one of the ingredients includes coconut milk and coconut oil, which is something that I’m not too crazy about eating, nor am I allowed by my dentist to eat hard nuts or seeds, like buckwheat!! What would be some alternative ingredients that you would suggest that I could use, instead! 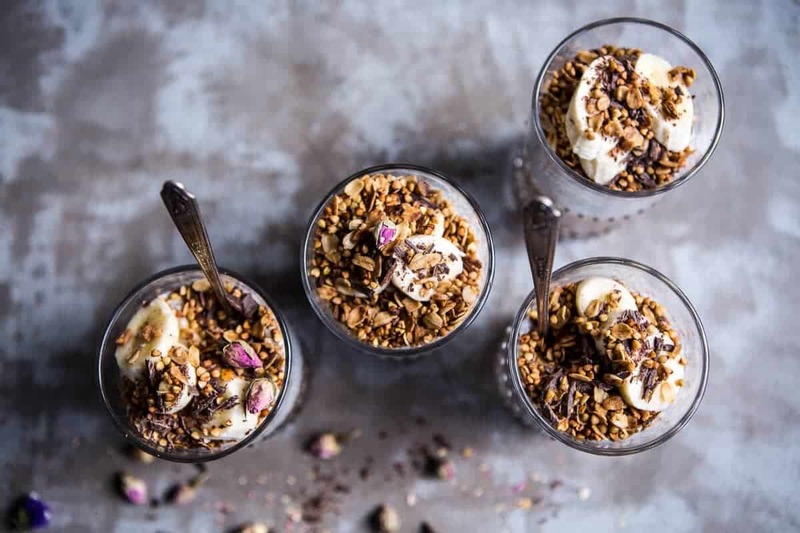 I’m really excited to give this recipe a go, and enjoy eating it either for breakfast or as a more “healthy” dessert option…Thanks for answering my questions!! Hey Kate! You can use whole milk in place of the coconut milk and either olive oil oil or butter in place of coconut oil. I would use old fashioned oats in place of the buckwheat. Let me know if you have any other questions. Hope to love this and thanks so much!! So awesome to hear that you loved it Dani!! Thank you! I assume that you would need to add the banana to make the coconut banana cream? It does not mention adding the banana anywhere except adding more banana if desired when assembling the layers.